The Best Oral Surgeon in San Francisco? The Very BEST Oral Surgeon In San Francisco? There are some fine oral surgeons in San Francisco, of that there is no doubt. However, our goal is, and always has been, to be the BEST oral surgeon in SF. Well, to begin with our doctor, Dr Alex Rabinovich, is recognized by his peers as being one of the leading authorities on oral surgery not just in San Francisco, but worldwide. Indeed, he is frequently invited to speak about aspects of oral surgery at medical conventions both in the US and overseas. He has also written or co-authored a number of medical publications. Dr Rabinovich is trained as both a DDS and an MD, and has a long list of qualifications. He has also performed thousands of oral surgeries over the years. He is an expert in Corrective Jaw Surgery, Facial Reconstruction, and Facial Cosmetic Surgery, and has worked alongside some of the most famous names in oral surgery in the world at Georgetown and Johns Hopkins Universities. But being the best oral surgeon in SF isn’t just restricted to the undoubted skills of one man. Dr Rabinovich has put together a team of highly trained and skilled clinicians and a staff that keeps right up to date with the latest technology by attending seminars and going on courses to learn about the newest techniques and equipment. We are also members of a number of dental associations. This ensures that our office is at the forefront of new developments. Our staff members are friendly and knowledgeable and dedicated to ensuring that each patient is treated as a person rather than a number. We know that dental and oral surgical procedures may make some of our patients feel ill at ease and we take every care to answer all your questions and make you feel at home when you need to visit us. 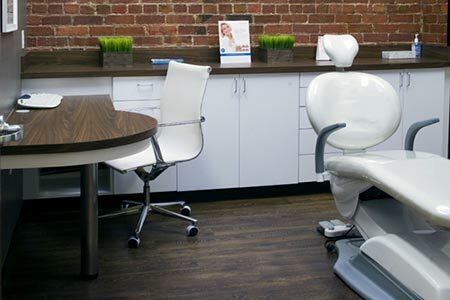 Our offices and surgery are clean and bright with state-of-the-art equipment and designed to make you feel comfortable. Dr Rabinovich uses the very latest ground-breaking imaging equipment which gives extremely accurate and high quality results and has the effect of reducing the number of patient visits. The NewTom 3D imaging machine is the only one which provides both vertical and horizontal views, thus providing the surgeon with the most complete information on which to decide his course of action. Being the best oral surgeon in SF includes offering all patients a wide range of different financial options, since Dr Rabinovich believes that no patient should be prevented from having the finest oral surgery available in the Bay Area simply through lack of immediate funds. We are certain to be able to provide a financial plan that is affordable for your particular circumstances. Dr Rabinovich also offers every patient a free consult when he can answer all of your questions. To book an appointment simply click on the Contact Us link at the top of this page, or call the office on (415) 817-9991. This entry was posted in Blog and tagged oral surgeon, Oral Surgery, San Francisco, San Francisco oral surgeon on March 14, 2017 by Dr Alex Rabinovich.